This is the most fun, interactive, edible holiday appetizer centerpiece I’ve ever made. Not only will it engage the whole family, but your guest’s faces with light up and twinkle like Christmas tree lights when they see it. Green cellophane or white food-safe plastic sheet to make a tree skirt. Working from the up, attach the kale leaves to the cone, using the wooden toothpicks, starting with the largest leaves first. Add kale leaves in a circular pattern, going from largest to smallest, until you get to the top of the tree. Place tree on a large cutting board and drape with cellophane or food-safe plastic to make a tree skirt and place to put the presents. 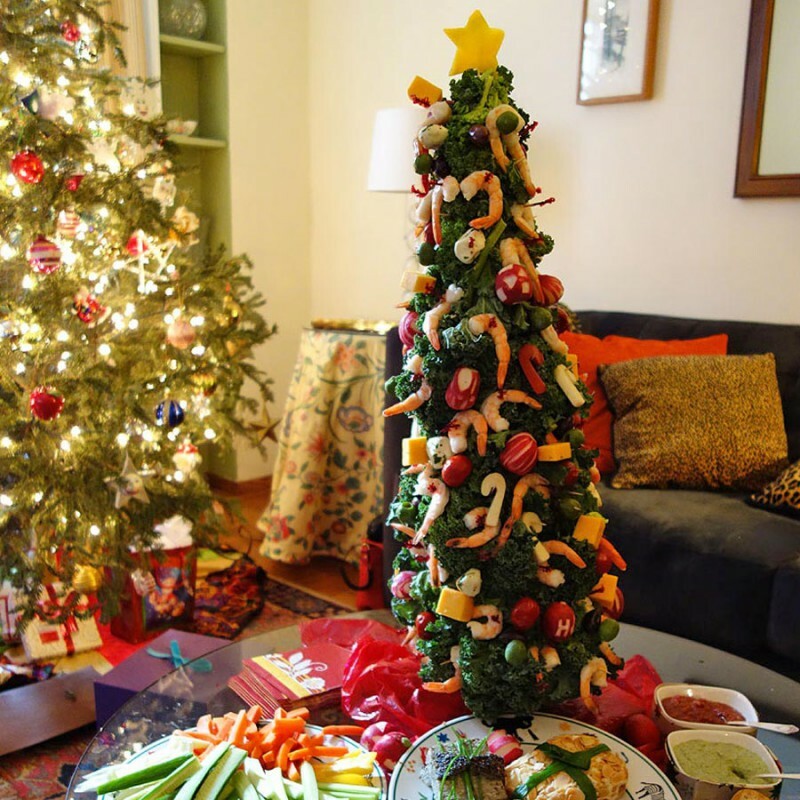 Place the “ornaments” as you like, adding the shrimp last so you can keep them in the fridge as long as possible before serving—come to think of it, an ice tree would be kind of cool, too. I used the frilly toothpicks for the shrimp. I used wooden toothpicks for everything else because I wanted the toothpicks to be hidden. Place “presents” and sauces around the tree. I bought the pate and cut off the peppercorn top and trimmed it into a bow. I served the Green Goddess Dip and Cocktail Sauce in bowls that I circled in cardboard wrapped in Christmas wrapping paper.